Spanish Chamomile is perennial herb with numerous stems with downy branches. It is a prostrate herb that resembles Chamomile to a greater extent. The stems lie on the ground, and rise erect towards the ends. Each of the stem bears one large flowers at branch-ends, with yellow colored disk, white colored rays and tinged with purple beneath. Leaves are alternate, smooth and pinnate. They are pale green in color with deeply cut segments. The root is somewhat cylindrical in shape and is slightly twisted. The roots are often crowned with a cluster of grey hairs. They are of brown color with bright black colored spots on it. 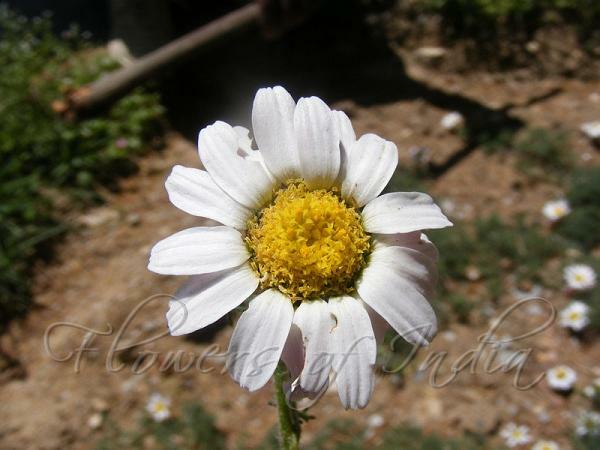 Spanish Chamomile is native to Algeria; Morocco; Spain. It is cultivated as a medicinal plant widely. Flowering: April-June. Medicinal uses: Ayurveda and Siddha have uses for this plant root and it has been used for centuries as a medicine. 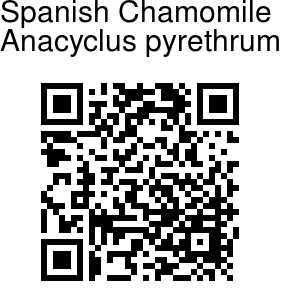 It is believed to act as aphrodisiac for men. Identification credit: Nidhan Singh Photographed in Herbal Garden, near Chakrata, Uttarakhand.